Atom is the smallest particle of a chemical element that retains all of its chemical properties. The atom consists of a nucleus with a positive electrical charge, and negatively charged electrons. The nucleus charge of any chemical element equals Z e, where Z - serial number of this element in the periodic system of chemical elements, e - value of the elementary electric charge. The electron is the smallest particle of matter with negative electric charge e=1.6 x 10-19 Coulomb adopted in the elementary electric charge. Electrons revolving around the nucleus, are located on the electronic shells K, L, M, and so on To the shell, the closest to the nucleus. The size of an atom is determined by the size of its shell. The atom can lose electrons and become a positive ion or attach electrons and become negative ion. Ion charge determines the number of lost or attach electrons. The process of transformation of neutral atoms in charged ion is called ionization. The atomic nucleus (the Central part of an atom consists of elementary nuclear particles - protons and neutrons. The core radius of about a hundred thousand times smaller than the radius of the atom. The density of the atomic nucleus is extremely high. The proton is stable elementary particle having a single positive electrical charge and mass, in 1836 times the electron mass. 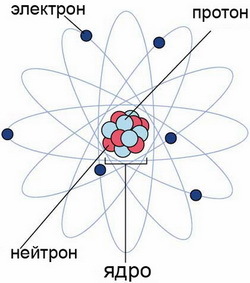 Proton is the nucleus of the atom, the lightest element, hydrogen. The number of protons in the nucleus is equal to Z. Neutron - neutral (without electric charge) elementary particle with the mass very close to the mass of a proton. Since the mass of the nucleus is the sum of the masses of protons and neutrons, the number of neutrons in the nucleus of the atom is equal to A - Z, where a is the mass number of this isotope (see Periodic system of chemical elements). The proton and neutron, included in the kernel, called nucleons. At the core of the nucleons are related to special nuclear forces. In an atomic nucleus has a huge reserve of energy, released in nuclear reactions. Nuclear reactions occur in the interaction of atomic nuclei with elementary particles or with nuclei of other elements. As a result of nuclear reactions, forming new kernel. For example, the neutron can turn into a proton. In this case, from the kernel released a beta particle, i.e., electron. The change of the kernel of a proton into a neutron can be done in two ways: either from the kernel is emitted particle with a mass equal to the mass of the electron, but with a positive charge, called a positron (positron decay)or the kernel grabs one of the electrons with the nearest K-shell (grip). Sometimes formed the nucleus possesses abundant energy is in the excited state) and, turning to normal, allocates extra energy in the form of electromagnetic radiation of very short wavelength - gamma radiation. The energy, released in nuclear reactions, practically used in various industries. The size of an atom is determined by the size of the electron shells and make up for all Z approximately 10-8 see As the bulk of all the electrons A. thousands of times smaller than the mass of the nucleus, the mass A. proportional to the mass number. The relative atomic mass of an atom of this isotope is determined in relation to the mass of A. isotope of carbon With12adopted for 12 units, and called isotope mass. It is close to a massive number of the corresponding isotope. The relative weight of A. chemical element is the average (taking into account the relative abundance of isotopes of a given element) is isotopic weight and is called the atomic mass (mass). The atom is the microscopic system, and its structure and properties can be explained only by means of quantum theory, created mainly in the 20-ies of the 20 century and is intended to describe phenomena in atomic scale. Experiments have shown that micro-particles - electrons, protons, atoms, and so on - except corpuscular, possess wave properties, shown in the diffraction and interference. In quantum theory to describe the state of micro-objects used for wave field, characterized by a wave function (&Psi-function). This function determines the probability of possible States of a micro-object, i.e., it characterizes the potential manifestations of these or those of its properties. The law changes the functions of the Interval in space and time (Schrodinger equation), allowing to find this function plays in the quantum theory the same role as in classical mechanics laws of motion, Newton's. Solution of the Schrodinger equation in many cases leads to a discrete possible States of the system. For example, in the case of the atom turns out a number of wave functions for electrons, corresponding to different (quantized) values of energy. The system of energy levels A., calculated by the methods of quantum theory, received an excellent confirmation in spectroscopy. The transition of the atom from the ground state, corresponding to the lowest energy level E0, in any of excited States Ei occurs through the absorption of certain portions of the energy Eof the i - E0. Horny A. becomes less excited or basic state usually with the emission of a photon. The energy of the photon hv equal to the energy difference of the atom in two States: hv= Ei- Ek where h is the Planck constant (6,62·10-27 erg·s), v is the frequency of light. In addition to the atomic spectra of quantum theory made it possible to explain and other properties A. In particular, were explained valence, the nature of the chemical bond and the structure of molecules, created the theory of periodic system of elements.